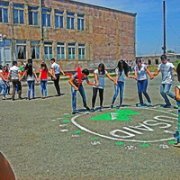 Yeghegnut school students of Armavir region had renovated the road leading to the school. On March 19, 2015 Junior Achievement of Armenia presented the 11 NGO grant awards to the winning school representatives. The student NGOs will supplement their NGO budgets with the 145,000 drams they received to carry out their projects. The President of each NGO and the respective teacher attended the ceremony. Junior Achievement is pleased to announce a grant competition for the Student NGOs for the 2015. 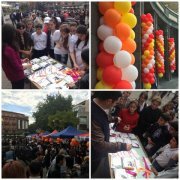 On October 18, 2014 Junior Achievement of Armenia held a Student Trade Fair within the framework of the USAID-funded “Entrepreneurial and Civic Activism of Young People of Armenia” and HSBC -funded "More Than Money" programs. The Student Trade Fair is an annual educational activity which allows the students to showcase their student company products and to demonstrate the entrepreneurial skills which they have attained during their studies.